A truly impressive new Baby Boy Luxury Gift Basket. Overflowing with a bonanza of premium quality organic clothing including a trio of high quality soft cotton bodysuits, a babygrow, duo muslins and bib from Frugi Organics, a designer playsuit and pram blanket by Olive & Moss London, handmade leather shoes, a keepsake Teddy Bear, a selection of award winning developmental toys suitable from birth, a choice of organic skincare gifts, and a ballotin of handmade chocolate truffles for Mum & Dad. An elegant Baby Boy Basket overflowing with a collection of beautiful organic baby clothing and accessories such as cuddle robes, blankets, booties and bibs, a variety of high quality toys, and a trio of pure and natural organic skincare gift sets for both baby and the new parents. 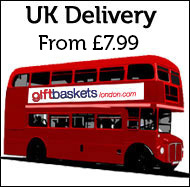 Named after the world famous Portland Hospital in London, where so many of our baby baskets are delivered to on a regular basis. This beautiful basket is filled to the brim with an assortment of lovely baby gifts to welcome the arrival of a new little baby boy. 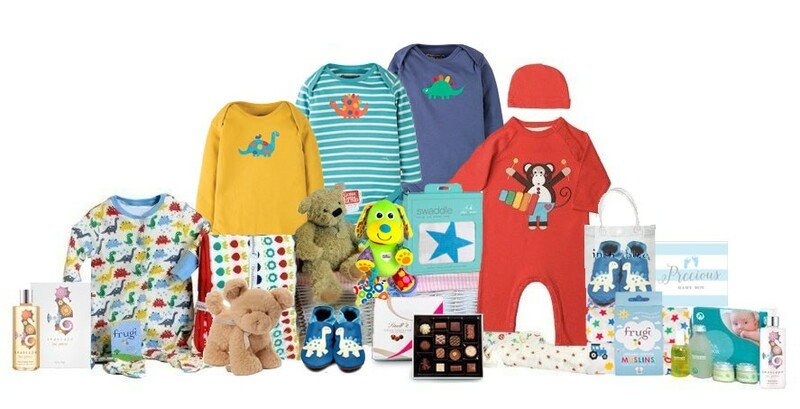 The highlights of which include an assortment of beautiful organic baby essential bodysuits, babygrows, and a luxurious knitted blanket, award winning toys, an organic skincare gift collection & a ballotin of handmade truffles for the new parents. Guaranteed to create an impression.